December 12, 2014. 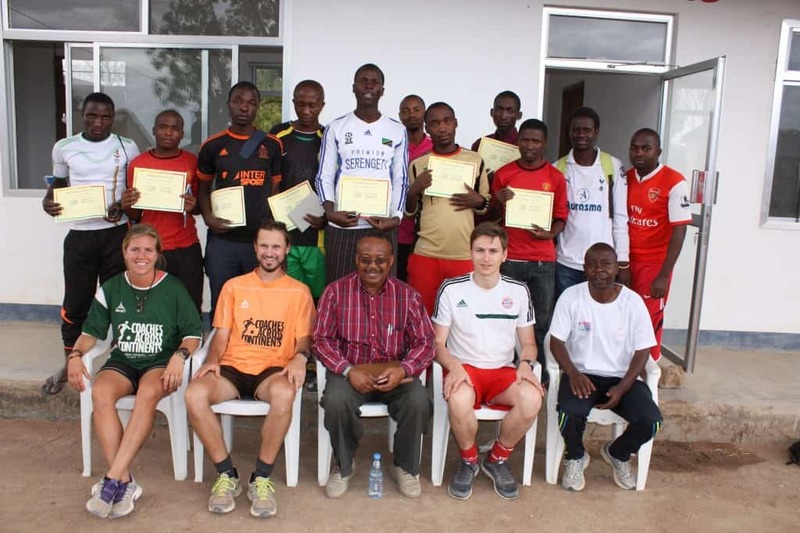 Volunteer Coach from Germany, Frederick Schwarzmaier, joins fellow countryman Markus Bensch as well as Kelly Conheeney in Tanzania. He writes about his first experience On-Field with CAC in Chamwino. Before any coaching session could start on Monday morning, we visited the District Executive Director of Chamwino, a highly respected woman. After introducing ourselves, Markus took a few minutes to talk about Coaches Across Continents as an organization and our approach in this community. As expected, she gave her consent for the program and we headed towards the local soccer pitch on motorbike-taxis with great anticipation and a box of new footballs. At arrival, reality quickly tempered us as only eight coaches showed up. Nico, the Community Impact Coach of Chamwino and an amazing go-to person, confirmed that eight would be our total number for the day. Given the low number of participants, we decided to play a fun game of soccer and start with the program on Tuesday. Afterwards, we went to meet the Chairman of Chamwino in order to introduce ourselves and explain what we are going to do in the next few days in his district. For us, this meeting was very worthwhile because the Chairman introduced us to the history of Chamwino as well as Tanzania, including a proudly presented story about the nation’s first president, Julius Nyerere, who visited Chamwino on several occasions. In order to make it a successful day over all, we coached over 40 girls from a local secondary school several CAC games including Ronaldo Skills for Life, Mingle Mingle and Pairs Soccer. The girls were visibly proud that their male fellow pupils were all along gazing at them while practicing their new soccer skills. Gratefully, on Tuesday twelve coaches showed up, hence, we decided to begin the program. Although, the number of participants was low, we had a very intense but fun week. As there were some returning coaches from previous years, they occasionally stepped in to teach their new peers certain games or moves on their own. This also showed us the impact of our program in this community on former participants. Besides, we set the focus on Child Rights and Gender Equality as this was requested by the community and regarded as one of their biggest current challenges. This issue especially arose when we were having a discussion about the rights of a child, as this is done within every CAC program and every community. Nearly half of the participants justified hitting their pupils or other children if they weren’t paying attention in class. An additional issue was the local coaches’ cheating manner. It took several attempts to announce fairly played winners in many of the conflict games, as it seemed that they cheat out of instinct. I felt as though this challenge was successfully tackled by us in a fun learning environment. Especially for me as a newbie at CAC, these circumstances made me contemplate the local culture. I tried to slip into the coaches’ shoes in the hope that I would find the root cause to their behavior. My explanation – you could also name it presumption as I do not have a scientific proof of it – for it is that they treat their children the same way as they were treated when they were young. Having this in mind while during our program in Chamwino, I was putting myself under too much pressure in order to transform the whole community into a better place and flood it with my ideas for improvement. I quickly realized that this approach is not working out and I should rather ask questions instead of giving possible answers as the CAC curriculum suggests. This method simply proofed to me the power and sustainability of the CAC approach. Combined with the uniting power of football, this program is even more amazing than I could have ever imagined before experiencing it myself. Besides, it is not only the local coaches but also me who are learning a lot. On Thursday, the local coaches taught the children the CAC games they learned this week. This was a great success as one could witness the drive and joy the coaches spread during their short and individual sessions with the kids. Their attitude created a setting where children could learn, laugh, play and fail without being afraid of consequences, no matter if girl or boy. Solely, one could criticize their urge to solve little problems for the children instead of letting them gain some problem solving experience themselves, e.g. fixing the human circle when playing Circle of Friends. Overall, it was fantastic seeing them teaching the kids. On Friday, after the last session of the program, we handed over the certificates to each participant that turned out to be more like a closing ceremony than a simple duty. Before we handed out the certificates, a representative of the local Education Office was the guest of honor and delivered a speech about the importance of implementing the CAC games in the learning curriculum of each school. After the ceremony, the participants surprised each of us with a shirt of Tanzania’s national soccer team – a great ending of a tiring but joyful week. Shortly afterwards, under pouring rain, we headed to Dodoma City to prepare for the upcoming program. 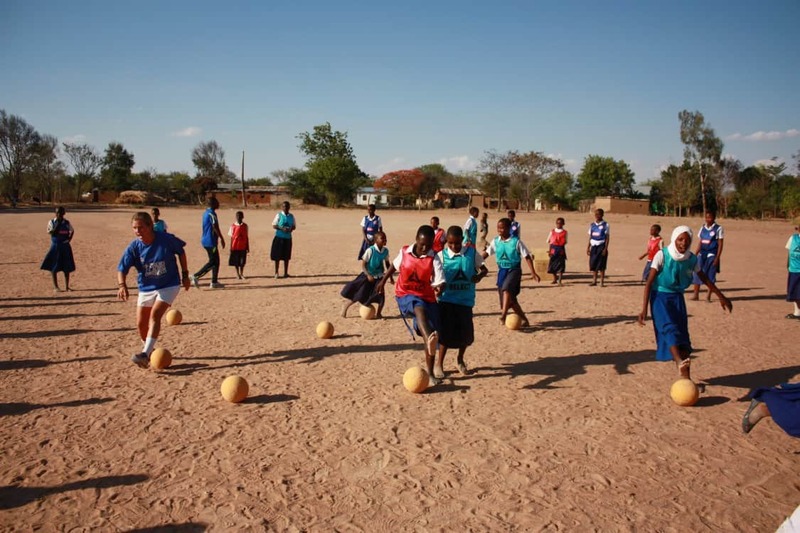 To put it in a nutshell, although struggling at the beginning of the week to get a sufficient number of local coaches for this year’s program in Chamwino, the week turned out to be a great success for all of us. We are confident we have made a sustainable impact on Chamwino’s community.